Additive manufacturing: 2-component print head vipro-HEAD with output pressure sensors. A new 2-component printhead developed by ViscoTec sets new technical standards: Both motors of the vipro-HEAD can be controlled directly via the 3D printer. Thus, 2-component viscous fluids and pastes can be mixed and printed even more precisely. This fact and the fact that the vipro-HEAD is additionally equipped with pressure sensors make processes in additive manufacturing even more efficient and reliable. The sensors monitor the outlet pressures of both components and thus guarantee optimum printing results. This is particularly relevant regarding series production, because only those who can guarantee uniform and repeatable part quality will remain competitive in the long term. With these technical innovations, ViscoTec meets the demands of the industry to design and coordinate the direct influencing factors in additive production – process, machine and product material – in such a way that the quality of a component can be constantly guaranteed throughout the entire series. The use of the separately controllable drives in the vipro-HEAD and the sensors are system-relevant improvements. The sensors help to avoid process delays or quality differences resulting from expired pot life and hardening mixers. A further advantage is: Stopping the mixing process in the event of pressure fluctuations protects the rotor and stator equally from damage. The high-quality sensors and the detachable 5 m long motor cables make the 2-component vipro-HEAD a flexible print head that can be integrated into the components of the additive manufacturing process. The main components of the print head relevant for printing are the rotor and stator, which ensure uniform and continuous delivery of the two components from the suction point to the outlet. 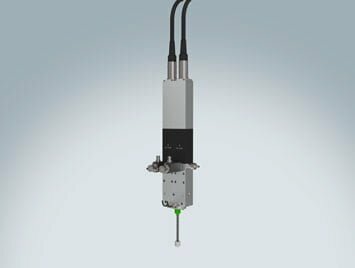 Even the smallest quantities can be conveyed – layer heights from 150 µm, depending on the product material – whereby the vipro-HEAD always guarantees the linearity of volume and speed. Thanks to this volumetric conveying principle, pastes and liquids can be processed almost regardless of their viscosity. This makes the vipro-HEAD the ideal print head for materials such as silicones, polyurethanes, acrylates or epoxy and polyester resins. Both material components can be fed into the static mixer individually and exactly in the desired dosage via one of the flow-optimized channels. The mixing of the two components takes place in the static mixer tube. Which static mixer customers choose depends on the materials used and the desired degree of mixing – the customer has the choice between a large number of mixers that can be attached to the print head. Another advantage of the vipro-HEAD, available in two sizes (3/3 and 5/5), is the optional venting screw, which enables the venting of excess air quickly and easily. The fact that both components enter the stator via a separate inlet and the fact that each of the two materials can be dosed individually is the basis for a reliable and high-quality production of 2-part components from liquids. The other is the absolutely pressure-tight displacement system developed by ViscoTec, which is also used in the vipro-HEAD – in both sizes 3/3 and 5/5. In a self-sealing system consisting of rotor and stator, a controlled rotary movement of the rotor takes place. As a result, the components are conveyed through their displacement in the stator. The special feature of this is that the material is returned by reversing the direction of rotation, also called retract. Thanks to this technical solution, the vipro-HEAD guarantees a controlled material thread break and thus the best quality in the end result. Chemical cross-linking of the individual layers produces 3D printed components that can withstand both mechanical and chemical stresses. With the vipro-HEAD, ViscoTec provides manufacturing and research companies from the automotive sector, electronics manufacturing, aerospace and medical technology with a solution for best results – from a qualitative and quantitative point of view.